Cheese Reporter Publishing Co., Inc.
Chicago—With a bit of imagination and innovation, cheese and dairy manufacturers can monetize their products by keeping up with food trends like the demand for new and novel foods, quest for better health and even that vexing plant-based dairy alternative movement. Lu Ann Williams, director of innovation with Innova Market Insights, recently spotlighted the 10 biggest food trends for 2019 and offered cheese and other dairy makers ways to capitalize on each trend. Specifically, manufacturers need to offer new and unique products for serious snackers; infuse those products with herbs, nuts, fruits or vegetables to be sold under the “healthy halo” of plants; and finally – package those products in an ecologically sustainable way. The trend of more adventurous consumers around the world and the discovery of new flavors is a big trend for 2019, particularly with more people traveling and being introduced to new foods. Innova has seen a 19 percent average annual growth of dairy launches tracked with the “discovery” claim, Williams said. A lot of the product marketing and messaging is around this whole idea of helping shoppers discover and explore something new, she said. “Black cheese is a perfect example of this – it’s a lemon flavored black cheese that looks so weird, but tastes so good,” Williams said. One variety of “black cheese” is made by Holland’s Van der Heiden Kaas B.V. 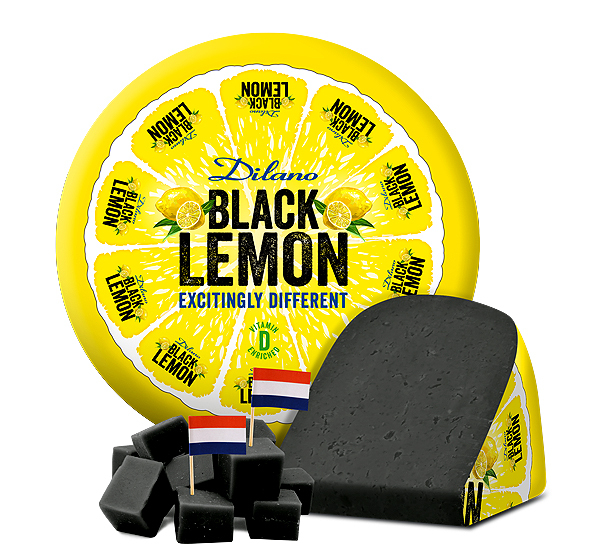 Inspired by the “blackened food movement,” the Black Lemon cheese has a mild, lemon flavor, enriched with vitamin D and finished off with charcoal. Find something that’s buzzable about your product that also delivers on taste, and gives your consumers something new to discover, she said. Dairy launches tracked with ethnic flavors have seen a 6 percent average growth over 2018, which represents nice, healthy growth, Williams said. You can also experiment with ways to entice consumers to try something different, she said. For example, a new savory yogurt is branded with the message: Ready to Eat, Use in Sauces or as a Dip. I think all the messaging there really supports the things I’ve been saying about discovery, Lu AnnWilliams said. It’s also for foodies – Red Pepper with Zing is something I would definitely try to find out what it is. Limited editions are also a nice way to introduce new flavors, like a winter-flavored processed cheese spread with honey mustard, Williams said. The anti-processed food trend has been around for almost 10 years, but manufacturers have the opportunity to showcase “positively processed” – making the processing part of a company’s story, she continued. Plant-based dairy alternatives is one of those huge trends that’s a big part of Innova’s endless research, and it’s moving much more mainstream. When we ask consumers how they are working to become healthier, a very significant number say “by increasing fruit and vegetables,’” Williams said. Everyone’s looking for ways to “green out” their portfolio, she said. For example, a typical lactose-free yogurt from Arla made with apples, spinach and lemons described as “green” – a traditional yogurt product using the allure of plants to attract consumers interested in a more plant-based diets. Other examples include cheese made with figs or other botanicals that impart flavor, she said. Both herbs and nuts are considered plants, so there’s many ways to add botanical ingredients to existing dairy products – use a bit of creativity to find new opportunities. “Additions like nuts and seeds in dairy launches is the fastest growing plant ingredient, followed by grains, vegetables, and fruits – things like raspberry, cranberry and beet root juice used in smoothies,” Williams said. Specifically, consumers are looking for more variety in their diets, sustainability, and novelty – which links back to the discovery trend, Williams said. “Especially if you look at categories that are mature or maybe even declining, and you look at consumers who are increasing their consumption in those categories, the number one reason is increased novelty and variety,” she continued. Examples include almond yogurt as a fermented, plant-based dessert – that’s going to be a huge trend, Lu AnnWilliams said – moving these products closer to traditional yogurt. However, vegan cheese is a hard product to sell, she continued. Domino’s in the Netherlands is offering vegan pizzas using vegan cheese, and it’s not quite there yet. But still, this is a huge opportunity for whoever can crack that nut. “We’re seeing increases in dairy-free cheeses as well,” Lu Ann Williams said. Overall, the vegan movement in terms of penetration is still quite small, with 6 percent of products in the dairy category with a vegan claim, but it’s growing quite fast – from a small base, but fast growth, she said. “There’s a lot of innovation in the vegan cheese base and to me, it’s one of the most interesting categories to watch,” Williams said. Everything involved in sustainability and transparency is very important, Williams said. A lot of companies have made great strides in this regard, but are still looking towards the next step. “We say the initiatives are a must. Two-thirds of US, UK and Chinese consumers expect companies to invest in sustainability. Everyone has to do something, and consumers expect you to do the best you can with the resources you have,” she said. One of the most challenging aspects of sustainability is packaging, Williams said. We see ethical packaging claims continuing to grow – those claims as a percentage of dairy launches is up to 52 percent, growing at 18 percent every year from 2014 to 2018. Williams again looked at Arla’s packaging, and how the company takes an entire side of its package to explain how it’s the most nature-friendly packaging ever. “This is going to be definitely one of the big stories, because companies have to look at costs of the packaging versus what your customers expect,” she said. Snacking has become a definitive occasion – consumers are planning their snacks the same way they plan for their meals, according to Innova research. “we’re seeing a lot of innovation in terms of making products more snackable. There’s lots of different ways to do it for yogurt, cereal and cheese. Cheese snacking is a huge thing, and there’s still a lot of opportunity out there. Data from different countries worldwide – the US, UK, Brazil, France and Germany –found that 63 percent of Millennials say they replace meals with snacks because they’re busy, and 50 percent of Gen X consumers say they’re cutting down on consumption of sweet snacks. Finally, two-thirds of Baby Boomers are making changes to their diets to become healthier. “As a result of all of this, we’re seeing a lot of innovation in terms of making products more snackable,” Williams said. “There’s lots of different ways to do it for yogurt, cereal and cheese. Cheese snacking is a huge thing, and there’s still a lot of opportunity out there,” she said. Innova has seen a 13 percent average growth rate of dairy launches tracked with a snacking claim. “Chobani has done a great job with the positioning, flavors and inclusions with their products to make them indulgent, but also a filling snack with a healthy side to it as well,” Williams said. As for pricing, consumers will often pay for convenience, she said. Full data and other market reports are available for purchase at www.innovamarketinsights.com. Moira Crowley has been Specialty Cheese Editor of Cheese Reporter since 2015. She has over 15 years experience covering the dairy industry through her work at Cheese Reporter. Her contributions to Cheese Reporter are read and referenced throughout the world. For more information, call 608-316-3793 mcrowley@cheesereporter.com. Whey Permeate Is Lower Cost, Sustainable Dairy Ingredient With Many Applications. More soon to be added.